Writer's Harvest for Feeding America. TAMPA, Fla. -- USF's Creative Writing Program hosted its seventh annual Writer's Harvest on Nov. 10 at the Mermaid Tavern. Writer's Harvest was open to the public, and all proceeds went towards Feeding America Tampa Bay. This year's event raised more than $500 for the charity. Attendees, ranging from USF students to members of the local writing community, were treated to a literary raffle, as well as a silent auction boasting signed Tampa Bay Lightning gear. Kristen Rouisse, a third-year M.F.A. poetry candidate at USF, coordinated this year's Writer's Harvest. "I couldn't be more thrilled with the turnout, funds raised and our incredible reading duo," Rouisse said. " USF has such a tight-knit writing community and it's always such a pleasure to see it in action." Featured readers Karen Brown and Silvia Curbelo were the highlight for the evening of camaraderie. Brown is a continuing instructor at USF. Her work has appeared in places such as The O. Henry Prize Stories, Best American Short Stories and The New York Times. Her latest novel, "The Clairvoyants," will be published by Henry Holt in 2017. Curbelo has received poetry fellowships from The National Endowments for the Arts, The Florida Division of Cultural Affairs and the Cintas Foundation, among others. Her latest poetry collection, "Falling Landscape," was published by Anhinga Press in 2015. 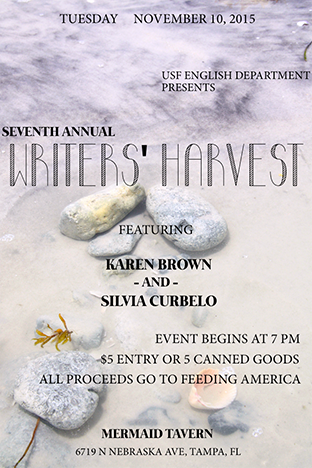 For more information about Writers' Harvest, contact Professor Ira Sukrungruang at isukrung@usf.edu.